Landscapes are a combination of a variety of features such as softscapes and hardscapes. The latter are essentially all the masonry elements that form the foundation of the rest of the elements in the landscaping. We at Scapes and Stones are a company that provides end-to-end landscaping solutions to customers throughout greater Las Vegas, NV and surrounds. In most instances, hardscape construction is part of a broader landscaping project. However, at times, customers also hire our services for their landscape upgrade projects, and we handle those with the same level of competency and dedication. We use the best materials in our work and focus on providing top notch workmanship. Travertine Paving - When it comes to outdoor spaces, one of the first things we focus on is the use of high grade materials that will be resilient and long-lasting. With this in view, travertine paver blocks are an excellent option. These are ideal for use in driveway, pathway, walkway and poolscape installations. 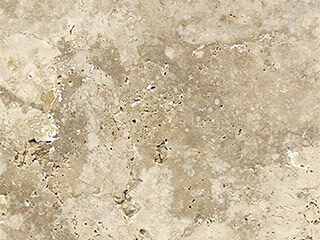 Travertine is an ideal stone for landscapes. It’s hardy, and porous, which allows the water to permeate into the ground below. Its porous quality also makes it an excellent stone for swimming pool areas, as the stone doesn’t get as heated as most other paver materials do. Apart from these applications, travertine veneer is also used to clad retaining walls. This lends the concrete walls a very elegant and unique look. Stone & Slate Hardscapes - Natural stone is very aesthetically appealing and fits in perfectly with most landscape design concepts. The primary reason for this is that natural stone is available in a number of varieties such as slate, bluestone, sandstone, granite, flagstone etc. We do use natural stone in the construction of retaining, boundary and garden walls. In some cases, this construction may be done using mortar, while in other cases; the stones might only be dry-stacked. We also use slate veneer in the hardscapes we build and use it to cover concrete block walls. This gives it the appearance of a natural stone wall, without the heaviness of stone. In fact, since the job is less labor-intensive, it also reduces the overall construction cost. We use the best stone in our work and our expert stone masons ensure that the job is done to the highest standards. 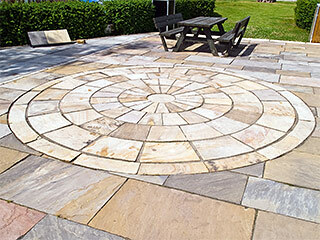 We focus on providing top quality solutions at low stonework cost, and this provides you value for money.